Joy! Chocolate Almond Joy! Ah, that coveted American candy bar with the luscious coating of chocolate over coconut and almonds. 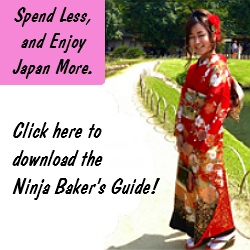 In Japan, Almond Joy slipped into my hands on 3 occasions. A military connection sneaked the Almond Joy off base and into my hands. Summer vacation in the States. Believe it or not! Better than an Almond Joy candy bar. Living in health conscious California, the Almond Joy combo still seduces the senses. Bravo to you if you disdain rich chocolate. Or abhor chocolate mingling in your mouth with crunchy almonds and coconut flakes. 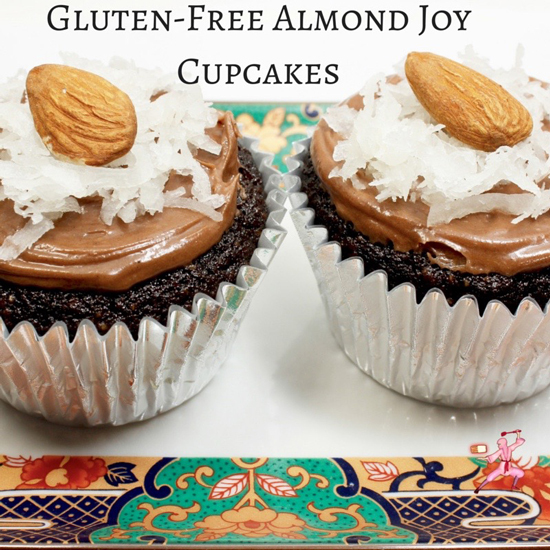 So, for today’s SundaySupper Back-to-School theme*1, I created Gluten-Free Almond Joy Cupcakes. Yes, it’s easier to slip a candy bar into a lunch box. (I get it. Life seems to have a way of cramming our calendars with must-dos.) 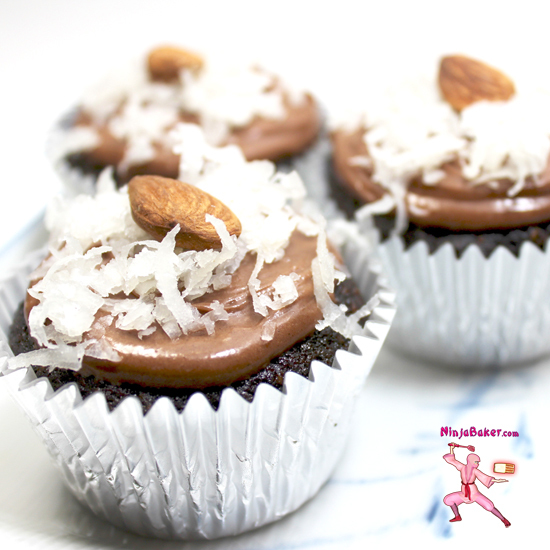 Take a tiny-weeny bit of extra time to bake and frost Gluten-Free Almond Joy Cupcakes. You will be rewarded. Your chest will swell with pride. Why?! You care enough to create a treat with natural ingredients. Your love will sing loud and clear in every bite of the cupcakes. When you finally take a break, you’ll have a treat on hand, which is 99.999% guilt-free. 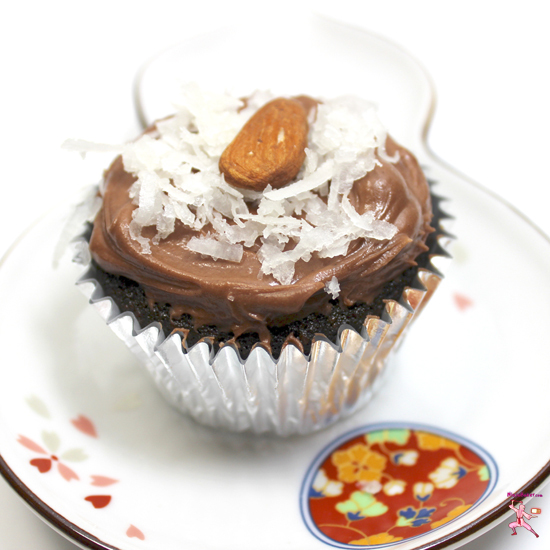 Almond Joy candy bar fun in a gluten-free cupcake! *1 Scroll down for your invite to the scrumptious #SundaySupper on Twitter. 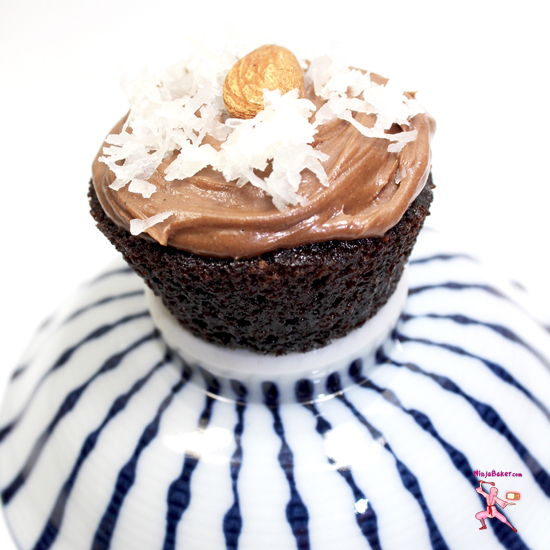 Gluten-Free Almond Joy Cupcakes are laden with all the luscious decadence of the Almond Joy candy bar. However, all the ingredients are au naturel. No chemicals. So, smile. Enjoy the lush mingling of chocolate, coconut and almonds! Melt the chocolate in a double boiler. Or set a heatproof bowl (like Pyrex) over a simmering pan of hot water. Once the chocolate is satiny smooth, stir in the creamer. Remove from the heat. Pour in the coconut oil. Whisk in eggs one at a time. Add the vanilla and vinegar. Transfer the contents to the bowl of a kitchen stand mixer. In a separate bowl, whisk together the flours, baking soda and salt. Add to the chocolate mixture. Beat for a minute or two until well combined. Divide the batter between the cupcake cases. Bake for 24-26 minutes or until a toothpick inserted in the center comes out clean. In the bowl of a kitchen stand mixer, fluff up the cream cheese on medium speed. Melt the chocolate in a double boiler. Or set a heatproof bowl (like Pyrex) over a simmering pan of hot water. 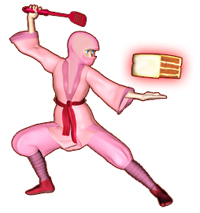 (Just like the batter for the cupcakes.) Remove from the heat and add to the cream cheese. Beat until smooth Gradually add the powdered sugar. Sprinkle in the vanilla. Beat for another minute or two until the frosting is completely smooth. Smooth the frosting over cooled cupcakes. Garnish with coconut flakes. Place one almond in each center. Caroline of Caroline's Cooking baked a beautiful batch of Banana and Chocolate Chip Muffins for our SundaySupper buffet. And assisted DB, the gourmet chef of Crazy Foodie Stunts assemble a list of crazy-good back-to-school treats. Wishing you school days filled with lessons of love.